Let’s listen to “Risky Romp”, which like many KHUx tracks, first appeared in Kingdom Hearts: Birth by Sleep. 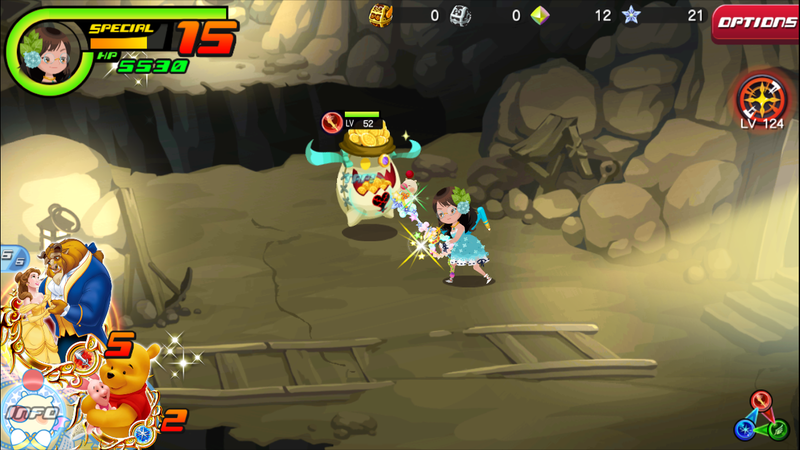 In Kingdom Hearts Union Cross, “Risky Romp” is the battle music for the Dwarf Woodlands. In “Risky Romp”, the violin uses two fairly standard techniques: regular bowing, and pizzicato. The pizzicato section occurs between 00:12 – 00:18 and 00:24 – 00:30—pizzicato is when the player plucks the strings with his or her fingers, rather than using the bow. It’s a much quicker, lighter sound. Now to get into other less common violin playing techniques that are not included in “Risky Romp”! There are many more extended techniques for the violin than the ones I will be introducing today, so please feel free to explore the great big, world of contemporary music to find out more! :3 First let’s talk about spiccato, then we will get into my favorite extended technique (which can be used for the cello as well), ponticello. Spiccato is when a player, instead of bowing the string normally, lets the bow bounce off of the string. I’d liken this technique to staccato—though spiccato would probably be considered a more specific way of playing staccato. Here’s a great example of a student learning how to play spiccato.